While the French sources did not say whether the two countries would ink a pact in the nuclear energy sector, India officials said that an agreement to expedite the Jaitapur nuclear plant was expected to be signed during the presidential visit. New Delhi: Ahead of French President Emmanuel Macron's maiden India trip, French sources said today that it would not be a "business as usual visit" and asserted that apart from conventional areas of cooperation such as nuclear energy and defence, the thrust would be on boosting ties in maritime and space fields. While the French sources did not say whether the two countries would ink a pact in the nuclear energy sector, India officials told PTI that an agreement to expedite the Jaitapur nuclear plant was expected to be signed during the presidential visit. France has also been strongly supporting India's bid for membership of the export-control regime Nuclear Suppliers Group. Special emphasis would be (laid on) cooperation in the Indian Ocean during the talks (between President Macron and Prime Minister Narendra Modi), a French source said, noting that France has strong economic and military interests in the Indian Ocean Region (IOR). The remarks by the French side assume significance in the backdrop of India, the US, Japan and Australia coming together and holding discussions on the sidelines of the India-ASEAN Summit in Manila last year on ways to boost cooperation in the IOR. France has military and naval bases in the IOR, which also has a sizeable French population. The IOR has also been witnessing increasing naval presence of China. 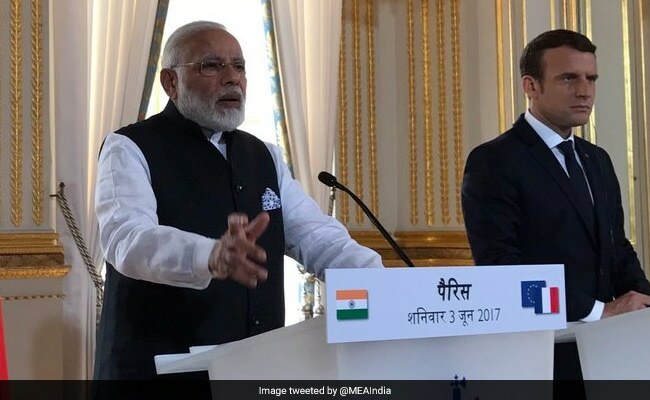 President Macron's trip would not be a business as usual visit and the thrust will be on intensifying partnership in other areas, including space and trade, the sources said, and noted that the two leaders (PM Modi and President Macron) will be spending a lot of time together and the visit has been planned that way". Defence has been one of the key pillars of strategic partnership and the visit will also focus on this aspect, the French source added. India has signed an inter-governmental agreement with France to procure 36 Rafale jets. Asked if international issues, including non-proliferation will be discussed, the French source said all issues of mutual interest will be deliberated upon. The source also noted that there was convergence of views between France and India, a "global power", on several issues such as rule of law and democratic values. Cooperation in the area of counter-terrorism will also be discussed during the bilateral meeting between PM Modi and President Macron on March 10. The French President will be accompanied by a business delegation of CEOs of 40 French companies, including those from the defence sector. The bilateral trade between India and France for the period from April 2016 to March 2017 reached $10.95 billion. France is the 9th largest foreign investor in India with a cumulative investment of $6.09 billion from April 2000 to October 2017. President Macron arrives in New Delhi on March 9, his first trip to India. The next day he will hold delegation-level talks with PM Modi. He will also take part in a Town Hall and have an interactive session, in which nearly 300 students from different levels and institutions are expected to participate on March 10. On the same day, he will also attend a Knowledge Summit which will be attended by more than 200 academicians from both sides. On March 11, President Macron will attend the International Solar Alliance (ISA) Summit, an initiative mooted by France and India. The ISA Summit, expected to be attended by several heads of the states and governments, is likely to focus on concrete projects . President Macron will also visit Varanasi, the parliamentary constituency of Prime Minister Modi, on March 11. He, along with PM Modi, will inaugurate a solar plant in Mirzapur in Uttar Pradesh. After Emmanuel Macron's India Trip, Amul Cheers "Growing Frenchship"